Cuchifritos is pleased to present, in collaboration with Double A Projects (artists Athena Robles and Anna Stein) a new project, the Free Emporium and Gift Exchange, specially designed for the space at Cuchifritos. The Free Emporium and Gift Exchange is a franchise of the project Global Free Store and offers both an exhibition and interactive storefront experience. In a boutique-like setting, Free Emporium and Gift Exchange showcases Global Free Store products, tags, prints and seeds, as well as photographs and video produced in conjunction with the Global Free Store. Visitors are encouraged to contribute their responses to the exhibition. In addition, as the gift-giving season is upon us, Free Emporium and Gift Exchange offers a special opportunity in which visitors can bring in their unwanted and unused holiday gifts to exchange for other items/unwanted gifts in the store. Free Emporium and Gift Exchange continues the work of Double A Projects to examine alternative systems of support and the creative ways in which communities work to sustain them. The Global Free Store and its emporium is a roving, artist-run collaborative project based on demonstrating principles of generosity, self-sustainability and a gift economy in art. 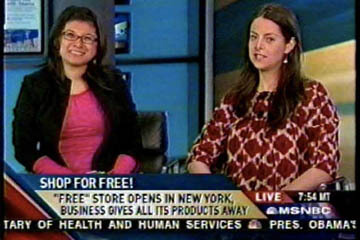 The debut incarnation of Global Free Store on Nassau Street attracted worldwide press and TV coverage in March 2009. To participate, bring canned or baking goods to the Free Emporium through Dec 16th during exhibition hours.